Porsha Williams & Dennis McKinley Welcome A Baby Girl! Baby PJ is here! Real Housewives of Atlanta star Porsha Williams is officially a mom! She and fiancé Dennis McKinley just welcomed their first child together. Previously, Porsha said that she wanted to name her little girl Porsha Jr. after herself, aka PJ. So did she go through with that plan? In an exclusive statement to People, Porsha and Dennis revealed that their daughter’s name is Pilar Jhena McKinley. Even though she’s not Porsha II, she is still rocking those “PJ” initials. So will they end up calling her “PJ” for short? She was born on Friday, March 22. Since Real Housewives of Atlanta wrapped and they filmed the dramatic reunion already, it is very unlikely that this was filmed for the show. 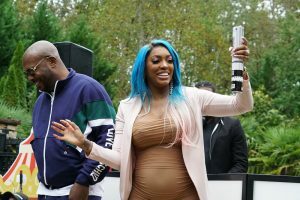 However, there were cameras spotted at Porsha’s baby shower. This sparked rumors of a spin-off show. So, maybe PJ’s debut was filmed, after all. Even if the birth was not filmed, Porsha’s daughter will have plenty of Bravo-related babies to play with. New dad Andy Cohen even tweeted, “Congratulations @Porsha4real on your baby! I hope to make a Love Connection for a Ben!” How cute would that be? Little PJ joins RHOA alum Kenya Moore’s daughter Brooklyn Daly as the latest baby from the franchise. Porsha’s good friend Shamea Morton gave birth to her first child in 2018. Eva Marcille welcomed a son in 2018 as well. And Porsha’s enemy-turned-frienemy Kandi Burruss is on track to have a baby via surrogate. There’s definitely a baby boom in Atlanta! TELL US- WHAT DO YOU THINK ABOUT THE NAME PILAR? DO YOU WANT PORSHA TO GET HER OWN SPIN-OFF SHOW OR SPECIAL? Eva Marcille’s Money Problems Revealed On Tonight’s Real Housewives Of Atlanta?